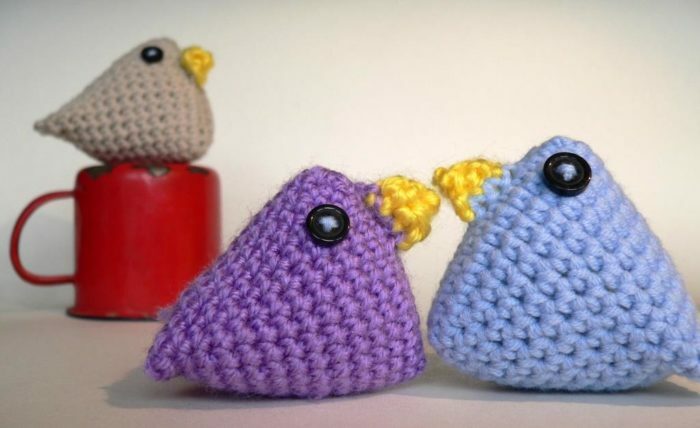 This FREE Mama Chicken Crochet Pattern was a very spontaneous affair. After I made my Super Quick Easter Chicks, I thought they looked awfully lonely without a mother. 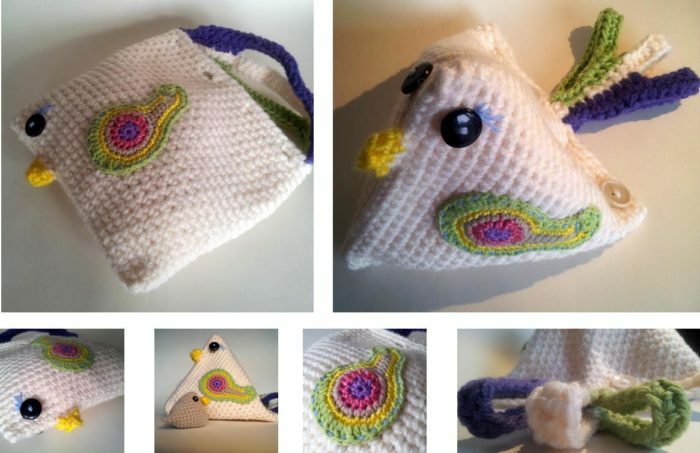 And then I thought: If I make a Mama Chicken, I might as well make her into a bag so that all the little chicks can have a safe place to sleep. The tricky bit was figuring out how many buttons I would need (and where they needed to go) to make the bag dual-buttonable. So whether your fancy is flat or 3 dimensional, I’ve got it sorted. I think she is cute enough to make any little girl giggle. 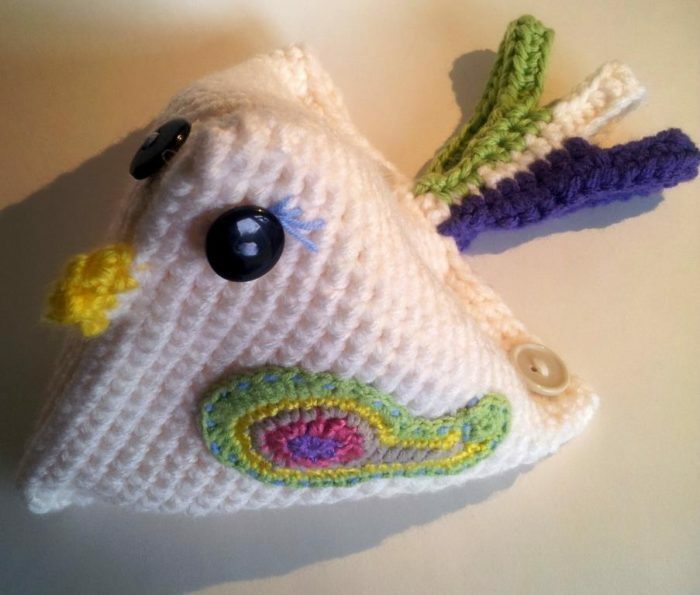 The Mama Chicken crochet pattern yields a bag that is roughly 20 cm square when flat and can hold about 10 Super Quick Easter Chicks. I hope you have as much fun with this pattern as I have had. Please note: I have not included progress pictures for Mama chicken’s body. 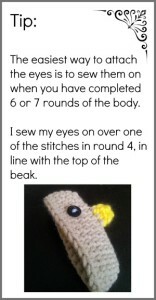 If you don’t understand the first 2 rounds, take a look at my Super Quick Easter Chicks pattern. The steps for making the first 2 rounds are well illustrated in that pattern and are hugely the same for Mama chicken, except that she needs 2 strands of chunky yarn and more stitches on either side of the beak. I suggest making one of the little chicks first and then tackling Mama Chicken. To make the wing, follow this pattern here. Skip round 6 of the Perfectly Paisley Pattern, because you will be attaching the wing to the bag using a running stitch. 1. Ch 5. The next 3 st’s will be worked into the beak. Insert your hook from back to front into the 3d st of the last row of the beak, and from front to back into the 4th st of the last row. This will naturally fold the beak in half. Make a sc through both layers. Make 2 more sc’s through both layers of the folded beak. Ch 15 and TURN. It is important that you turn, otherwise you’ll be working on the inside of your chicken, not the outside. Don’t turn, just continue around, working the first st of each round into the first st of the previous round. Use a st marker to mark the beginning of each round if you prefer. I always do. 25. Sc x 7. Fold Mama Chicken Flat. You should end up 2 stitches after the fold. If you don’t, fudge it. You will be making the button holes in this round. They will be lopsided, but they need to be so that you can close Mama Chicken when she is both a bag AND a chicken. So starting 2 st’s after the fold: *ch 2, skip 2, sc x 10* x 3. Ch 2, skip 2, sc x 3. 26. Sc x 7, *sc x 2 into the ch-2 button hole, sc x 10* x 3. Sc x 2 into the ch-2 button hole, sc x 3. Sl st in the next st and bind off. Work away your tails. 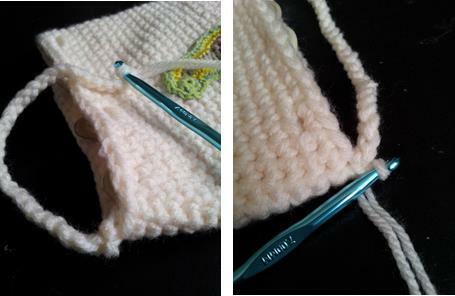 Fold your bag flat and join your yarn (with a sl st) to the st on the fold of the bag. Ch 30. Sl st into the st on the other fold of the bag. Ch 1 and turn. Sl st in the 1st 3 st’s. Sc x 3, hdc x 18, sc x 3, sl st x 3. Sl st in the same st as joining. Bind off and work away your tails. This will form the middle of the handle (or the middle tail feather). 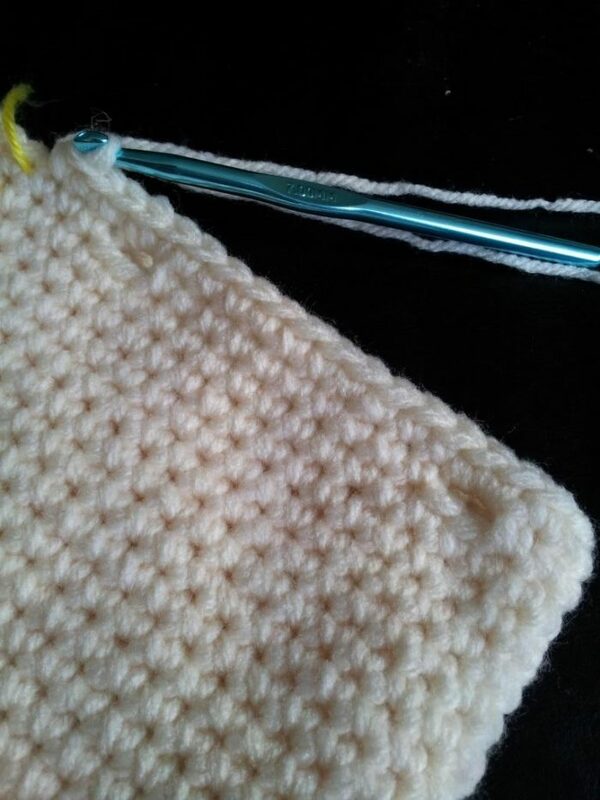 With a new colour: Join your yarn by working a sl st into the st BEFORE the previous join (see photo below). Sc x 3 (one sc in each of the first 3 st’s of the handle). Hdc x 5, Ch 14 and skip 14. Hdc x 5, sc x 3. Join to the next st of the last round of the bag with a sl st. Ch 1 and turn. Sl st in the 1st 3 st’s. Sc x 3, hdc x 18, sc x 3, sl st x 3. Sl st in the same st as joining. Bind off and work away your tails. Flip the bag around so that you start this round on the opposite fold. You want to be working into the other side of the first “feather”. 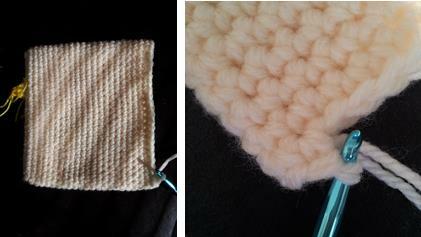 So with a new colour: Join your yarn by working a sl st into the st BEFORE the previous join. Sc x 3, hdc x 5, Ch 14 and skip 14. Hdc x 5, sc x 3. Join to the next st of the last round of the bag with a sl st. Ch 1 and turn. You will need to sew the buttons onto the inside of the bag around the 5th st AFTER every button-hole. So…count 5 stitches to the left of any of the button holes and sew your button around the post of the stitch (with the button on the INSIDE of the bag). Repeat for all 4 buttons. Place your wing in the middle of the bag with the rounded edge in line with the top of the fourth round of the bag. Using any colour you wish, attach the wing to the bag with a running stitch. I cheat a little when I do my running stitches…I hate having to insert the needle and then pull it through from the inside, insert it again and then pull it through from the outside…so boring. So I insert my needle into the next st of the wing and then snag a little loop of yarn from the bag, right beneath the stitch. I then pull my needle out through the next st of the wing and repeat the process. Using this method you get a nice clean finish on the inside of the bag as well. And here she is: Mama chicken ready to receive her load of Super Quick Easter Chicks. Remember to subscribe to my newsletter if you would like to be kept in the loop, or you can like my facebook page if that’s more your thing. Aw dis gorgeous Dedri! Jy is so ongelooflik amazing! !